In today’s world there is always a chance of a disaster happening. Some of which might mean people will be in need of having a survival backpack to help them survive. It is wise to always carry a survival bag (emergency bag) when going on trips anyway. In any of these cases a survival bag will be a wise thing to have. A compass is one of the items one should have in their survival bag. It will be beneficial to anyone that gets lost or loses track of the direction they were going in. It works off of a magnetic pointer, using the magnetic field of the earth to calculate the directions that it gives. Having a map would add an additional benefit, of course. In today’s modern world people are using a GPS system for directions, however, if the GPS requires a battery, the compass would still be the better route to take. Being able to build a fire may come as a necessity in a survival situation. Which is necessary for warmth, cooking, and purifying water. Afire is also beneficial sometimes for security, as well as providing a light source. This is why one should always stock their survival bag with the items needed to start a small fire. Some of the things would be lighters, matches (ones that are waterproof), and magnifying glasses (which can be used with the sun to start a fire). 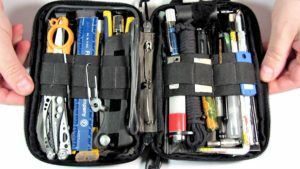 A medical kit containing solutions to clean wounds, medications, peroxide, antacid, pain medications, bandages, eye washes, and anti-bacteria ointments. Any medications one might already be on should also be carried. Having a small mirror in the survival pack is a good idea too. It can be used to signal for help, flashing beams, and headlights (should they go out). Remember that the moon can even be used in case one is in need of being rescued. Another good too to have is a knife. This could be very significant for your survival. A knife with a long blade, serrated edge, and long handle, will come in handier than a regular or cheaper knife. Another item to put in survival bag is a kit with a suction extractor which may save a life if snake bitten or stung. There is also anti-inflammatory medication available. An emergency whistle should certainly be carried, for it can be used in situations where one may get weak, or unable to talk, such as a poisonous snake bite. A water filter is another useful tool to have in a survival bag. They also sell water tablets now, which are either iodine or chlorine pills, they can be helpful in keeping a person alive. Certain medications such be kept in compartments that will make getting to them easy and quick. The tools mentioned above are all essential for your survival and should be paid close attention to.